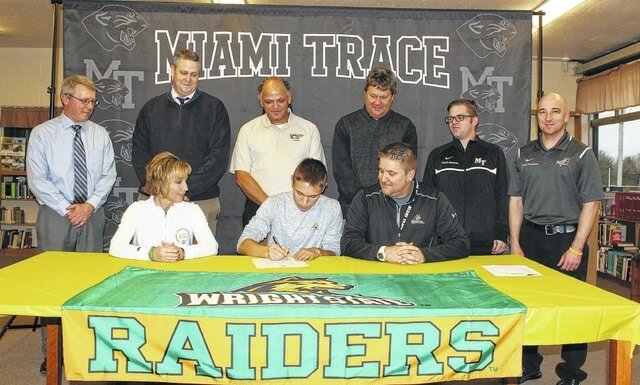 Blake Pittser, a senior at Miami Trace High School, signs a letter of intent to attend Wright State University on a full scholarship where he will continue his soccer career and study Biomedical Engineering. He is joined by his parents, Kim and Rob and (standing, l-r); Rob Enochs, Miami Trace Principal; Aaron Hammond, the school’s athletic director; Scooby Daniels, director of Ohio Galaxies; Brian Kohen, NWC Alliance coach and his high school coaches, Sean Sweeney and head coach Josh Thoroman. Blake Pittser began playing soccer when he was eight years old. It’s 10 years later, now and the Miami Trace senior has signed a letter of intent to continue playing soccer in college. On Wednesday, dozens of folks crowded into the library at Miami Trace High School to witness the milestone event. Pittser was joined by his family, basketball and soccer teammates, friends, coaches and administrators for the ceremony. Pittser will be attending Wright State University, which is Division I in soccer. “I’m committed to go play on the men’s soccer team this fall at Wright State University,” Pittser said. “They’re in the Horizon League. They won it last year, maybe the last two years. It’s good competition. It’ll be good for me. “Their coaches, especially their assistant coach, has been around our club for a while,” Pittser said. “So, I knew him and I was comfortable with him. When I was looking around at the different schools, I kind of felt like Wright State hit home. Some of my family has gone there and I’m familiar with the campus. Plus, it’s close to home. “I have a club teammate who’s going to sign with Wright State,” Pittser said. In club soccer, Pittser played for the NWC Alliance from 2006 through 2013 and the Ohio Galaxies from 2013 to the present. The NWC Alliance team was Ohio State Cup champions in 2013. Pittser played with them from age 8 through 14. The Ohio Galaxies won the Ohio State Cup in 2014 and 2016. Pittser played with them since age 15. The Galaxies were also Midwest Regional League champions (covering 14 states) in 2014 and 2016. Pittser’s athletic accomplishments are virtually unparalleled at Miami Trace. 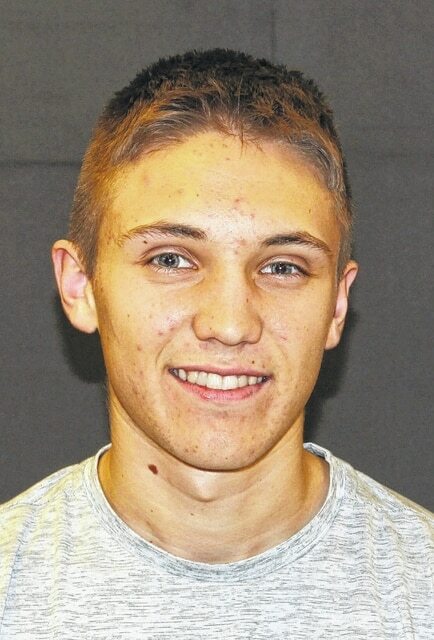 He is on track to earn 20 varsity letters in five sports. A record that will be almost impossible to surpass. In addition to soccer, Pittser was the kicker on the football team and ran cross country in the fall; he’s a starter on basketball team and a distance runner for the track team in the spring. Pittser is Miami Trace’s all-time leading scorer in soccer with 59 career goals and 25 career assists. He was First Team, All-SCOL and First Team, All-SE District both for four years. Pittser is Miami Trace’s first all-state soccer player and was the captain of the school’s first Sectional champion soccer team (2016). “I’ve been told I can get playing time,” Pittser said. “That was a big thing for me. As a freshman, I want to play, I didn’t want to go and sit somewhere. Pittser was asked about his academic interests at Miami Trace. “I’ve always been a big science guy,” Pittser said. “I kind of like all my classes. I liked Mrs. Jenks’ English class and Mrs. West’s English class. I thought we studied some neat stuff. What about best moments or memories from his prep career? “I’ve enjoyed all four years,” Pittser said. “We had a winning season this year, one of the few we’ve had. We won the school’s first soccer Sectional title, so, that was really cool. “I want to thank God for the blessings, the talents He’s given to me,” Pittser said. “He’s blessed me all of my life. Pittser is the grandson of Bob and Meda Pittser and Ron and Linda Robbins.